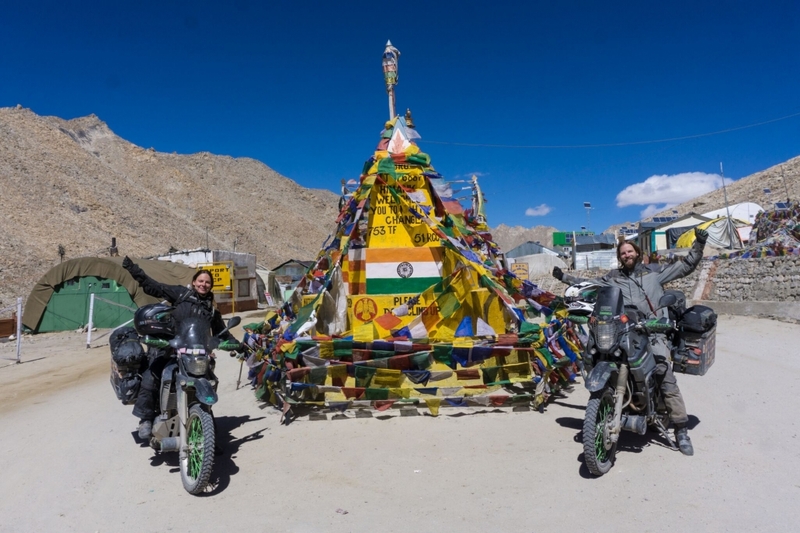 Xenia and Tinu left Switzerland in February of 2017 on a pair of Yamaha XT 660 Motorcycles and have been travelling the world since. They run a very cool YouTube Channel. You can subscribe to their channel to stay in touch with their video updates. Of course, you can also follow them on their social media platforms Instagram and Facebook to stay in up to date with all their travels and updates. As always, I highly recommend visiting the website for any traveler or travelers you are interested in. It’s the best place to learn about the story they want to tell and learning about the travels and the people. 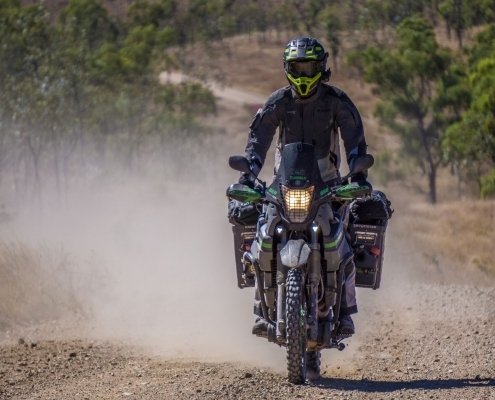 https://xtadventures.ch/ is a great site and contains all kinds of information about their bikes, equipment, supporters, and their travels. @XTAdventures are a great reminder that life is about the journey. We aren’t guaranteed anything and there is no time like the present to start moving in a direction of the life you want to live. Check out the interview and some of their great photos below. Martin is a cabinet maker and Xenia an IT specialist. We both did work hard before we left for the trip to make sure we have enough money together for this trip. The savings should be enough even if we now travel a little longer than we first have planned. 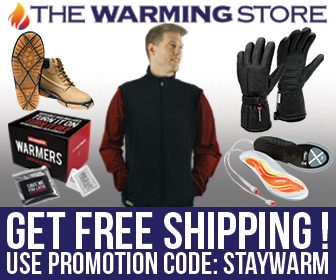 With a little help through our Patreon page and some product sells, we can add a little extra that helps with buying additional gadgets like a drone or our 360 degrees GoPro Fusion. Tell me about your bike. What do you call them? We both ride Yamaha XT660 bikes. 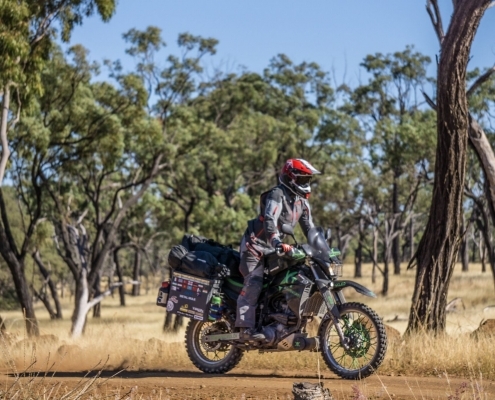 Martin’s bike is a Yamaha XT660Z with ABS from 2013 and it’s called Kira the second, as Kira the first got destroyed on his first trip through South America. Xenia owns an XT660R from 2005 and calls it Neo because she is a nerd and because her beloved cat who lives with her parents is called Neo as well. What other vehicles did you consider for your travels and what made you ultimately pull the trigger on the ones you bought? It was pretty clear from the beginning that we will do this world trip on our motorbikes, which we already had before. We have been travelling with them before this big trip in several countries in and around Europe. Martin also did a trip to South America for 6 months, where we actually met. Therefore we never had a plan to do this trip with any other vehicle. 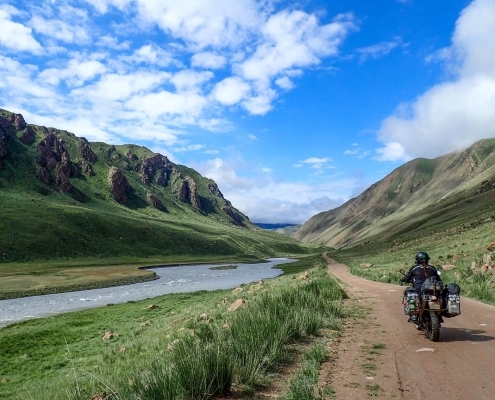 We love the fact that you are so close to nature and the people when travelling on motorbikes and we enjoy riding a lot. We also never thought about getting other bikes just for this trip. The XT660 engine is known for its quality and Yamaha in general is a very good brand to choose for a trip like this. 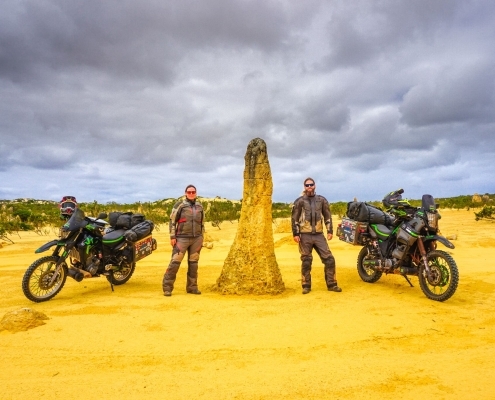 For us it was clear that we rather do not take too modern bikes for this, as most of the countries we have been to have no dealers which can help you if your electronics play up. Yamaha uses a lot of standard screws and bearings, which makes it very easy to find parts in third world countries. We never had any issues in the past 2 years and never regretted that we took these bikes. 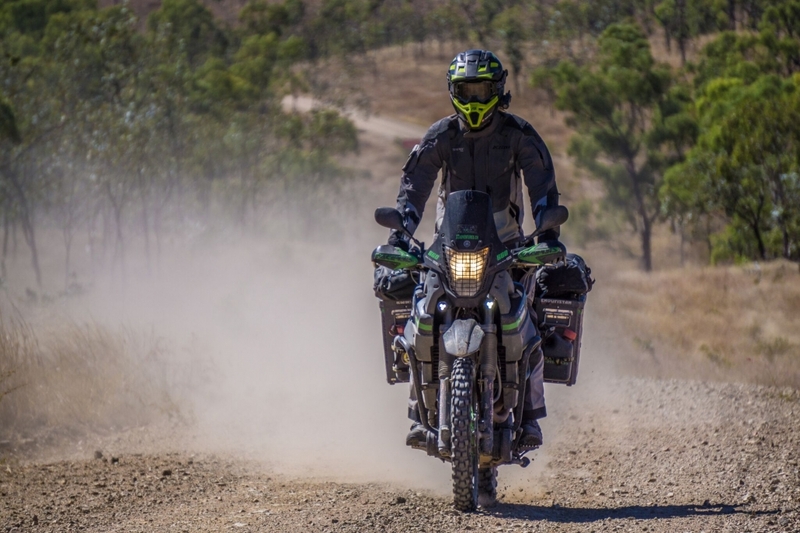 Of course there is no real perfect bike for a world trip, as it would be great to have a lighter bike for all the gravel and dirt tracks but then again you sometimes have to do many kilometers on paved roads. Have you made any upgrades or changes to them? We changed quite a bit on the bikes to make sure they are comfortable, safe and perform as good as possible. For example we exchanged the suspensions, upgraded and changed the saddles, made sure we can charge all our electronics while riding and added better foot pegs. We got ourselves luggage systems by MetalMule and auxiliary light from 4XLED, to make sure the bikes are well equipped for a long trip. Another important point for us is to get fuel filters by Guglatech, to make sure our fuel pumps survive all the dirty petrol, which they perfectly did so far. 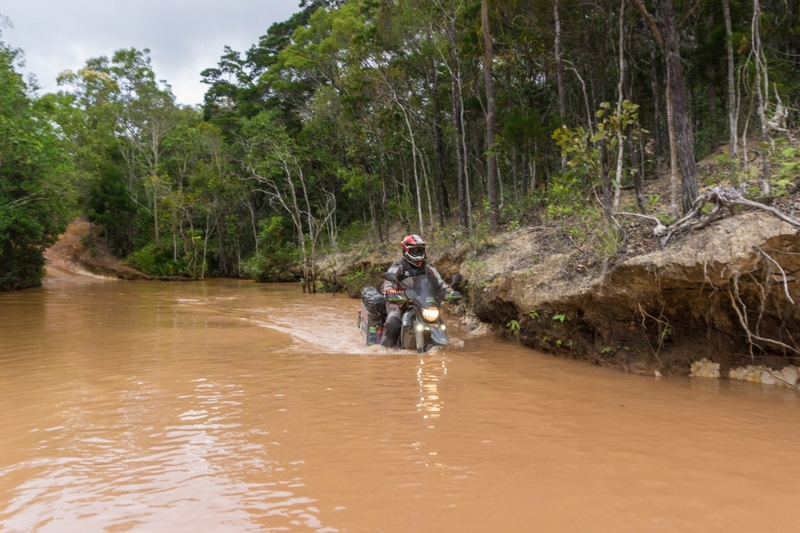 We use extra strong motocross tubes and tyres by Heidenau to get as many kilometers and as little punctures as possible. On our web page we have a list with all adjustments we did on the bikes so far. What is your favorite part about it living/working off of your motorcycle? That we are free to go wherever we want. 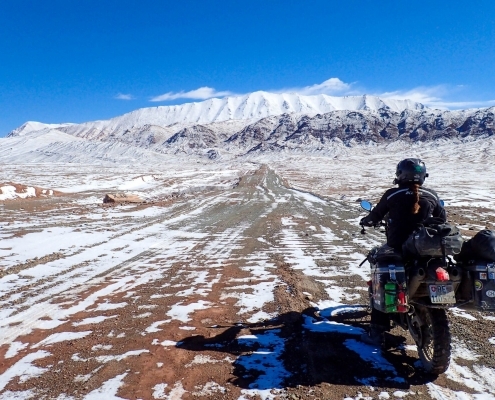 As we ride a lot of unpaved roads we can reach remote areas which we love. You are outside all the time and its fun to ride a motorbike in general. 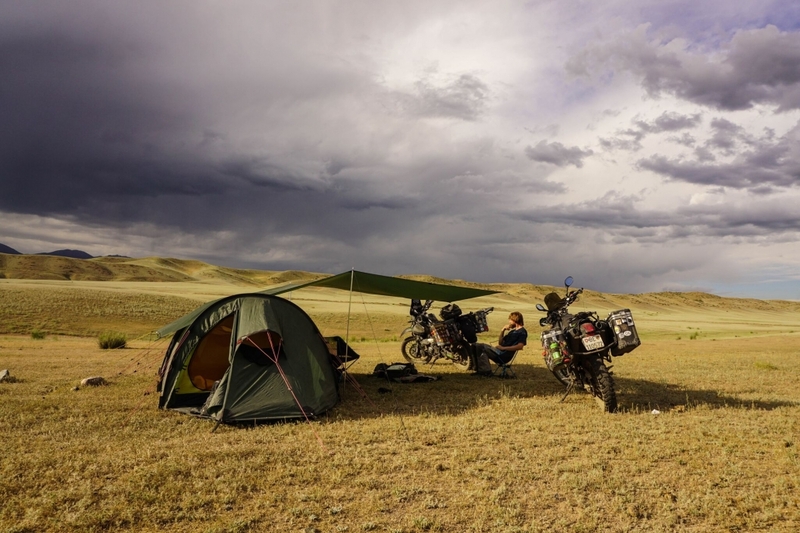 We love to be so connected to nature, not only while riding but also while camping, therefore for us it’s the best way to explore the world. Sometimes it can be really hard to maintain the bikes when you have no place to work on them or just can’t get your hands on the right parts or oil. We try to be very strict with maintenance as we plan to ride for 4 years in total, so this can be a bit stressfull in certain places. 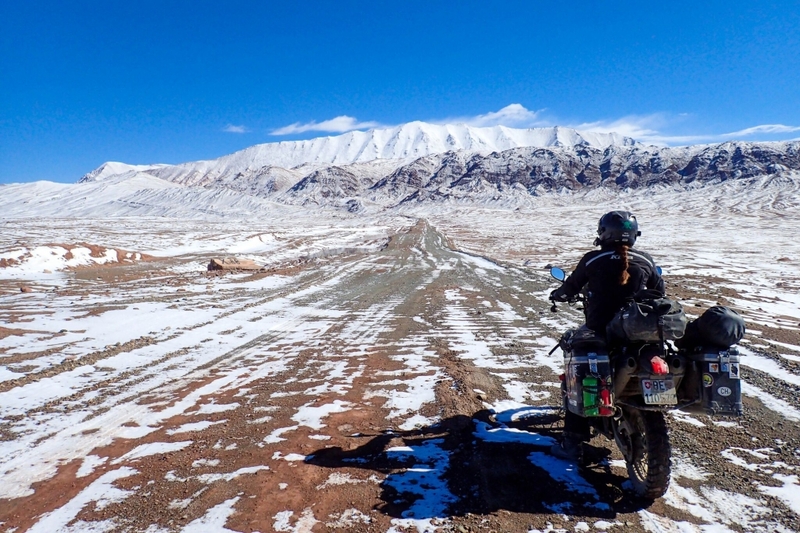 Also getting the bikes from one continent to another is not always fun and we had some really horrible experience with it. How many kilometers have you put on your bikes? 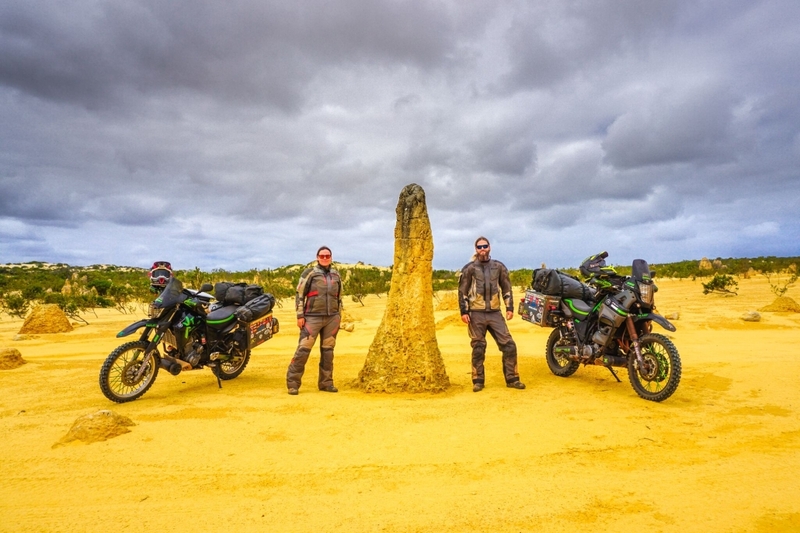 We did on this trip about 63’000km but Xenias bike has already over 116’000km and Martins bike over 83’000km. We already traveled quite a bit on them before. What is the best place you have taken them? 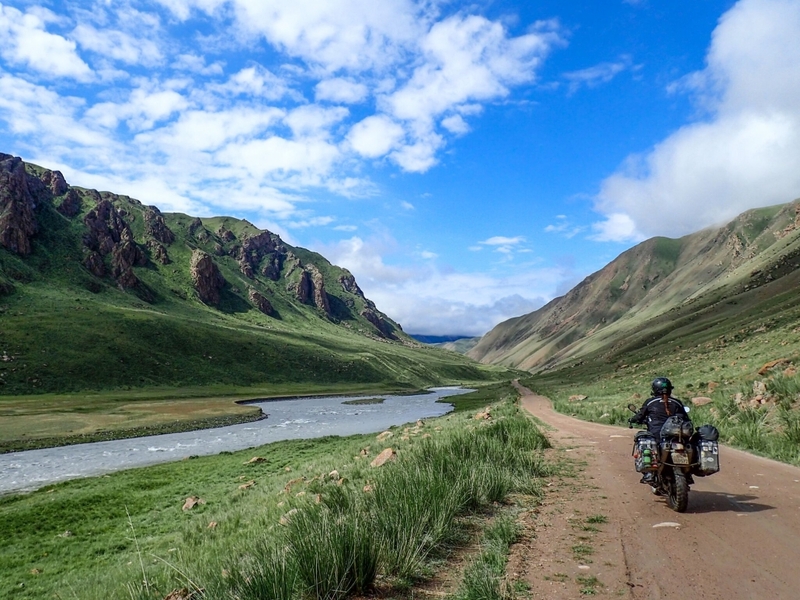 Hard to say as so many places are wonderful but Kyrgyzstan is probably our favorite country if we would need to make a choice. It is just an amazing country with beautiful countryside, loads of dirt roads and the best wild camping spots ever. No all of the places we visited we loved for different reasons. For the nice people, the yummy food, the beautiful nature, the amazing history or the great challenge…we think every place in the world is worth to visit. Phu that’s a hard one. 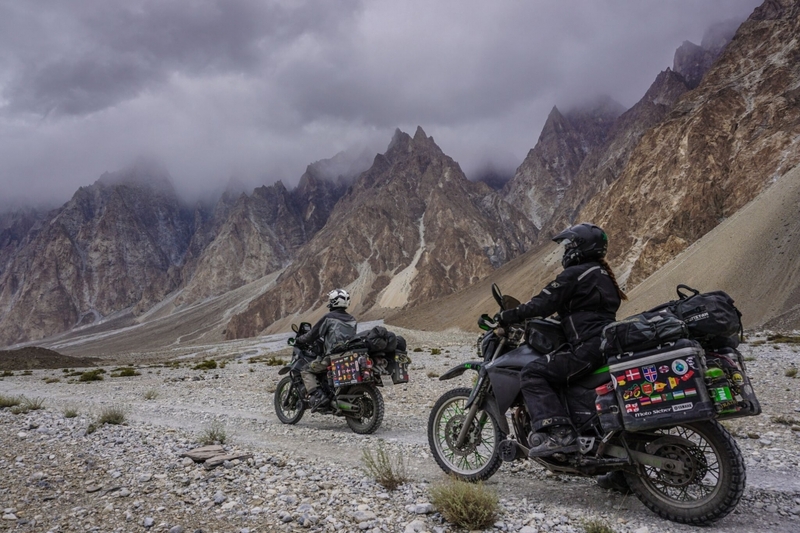 There was the Tosor Pass in Kyrgyzstan or the Shimshal Valley in Pakistan which were fantastic. 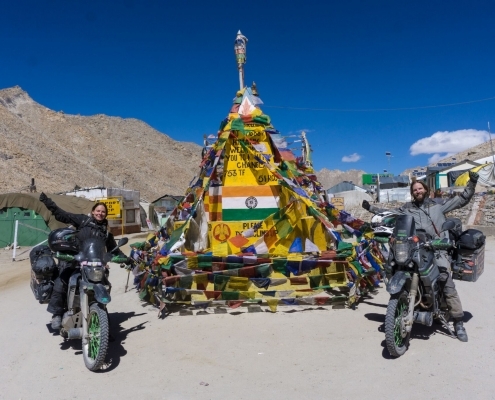 Of course North India with some of the highest passes in the world was stunning too or the way up to lower Mustang in Nepal. 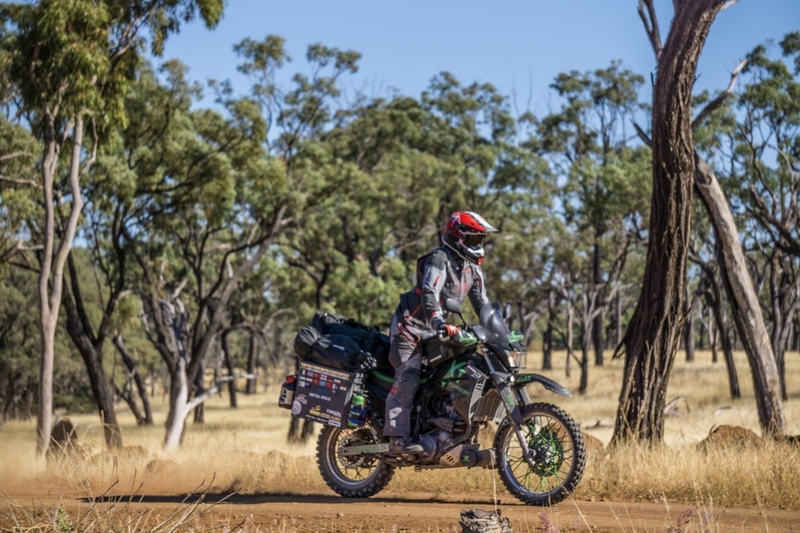 We love a challenge therefore dirt roads are always our favourite roads. 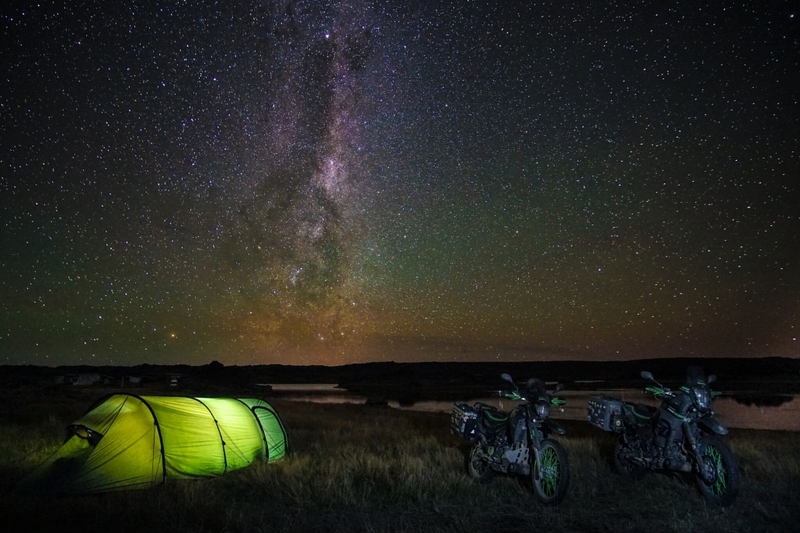 If you could give a person one piece of advice when thinking about living from a motorcycle, what would you tell them? The hardest part is probably to let go of your „normal“ life, but as soon as you are on the road everything falls to place. Set a date and just go. Don’t overthink it too much, as it is less hard than one might think. Xenia always traveled a lot, first as a child with her parents, then many years by herself and then together with Martin, therefore she does not know a life without this. Martin first discovered his adventurous spirit when he moved to the States for a while to work there and then did many road trips while there. It is not really about being special but just having the urge to get out of your comfort zone. As Xenia traveled a lot as a child she learnt to be open about other people and other cultures, no matter what happens or if you like it or not. She always went camping with her family which gave her a good sense of being outdoors and living a simple life. Martin learnt from a young age to be polite and to treat people the way he would like to be treated. He stays calm in difficult situations and is always very organized with his things. When he starts something, he goes through with it all the way. As it is in Xenias blood to travel, it is kinda what she does and therefore she came up with the idea of a several year world trip and Martin happily embraced it even if it took a little bit to actually get comfortable with the length of the planned trip. We will travel a few months longer in Australia before we start our next chapter in Africa. We plan to travel across Africa back to Europe and are really looking forward to this new adventure! It will take us at least another 1.5 years to get back to Europe though therefore we don’t really know yet what life will throw at us when we arrive there. Family and work or just some more adventures? We will see!